Registration for Greenwood Fest opens this coming Wednesday January 4th. http://www.greenwoodfest.org/ I’ll have reminders here, and the Plymouth CRAFT newsletter will announce it too. Sign up for the newsletter if you haven’t already (under the “registration” tab on the GWF site). I have not got to all the instructor profiles yet – there’s a few more returning instructors, but here’s another new one for us, Jane Mickelborough. 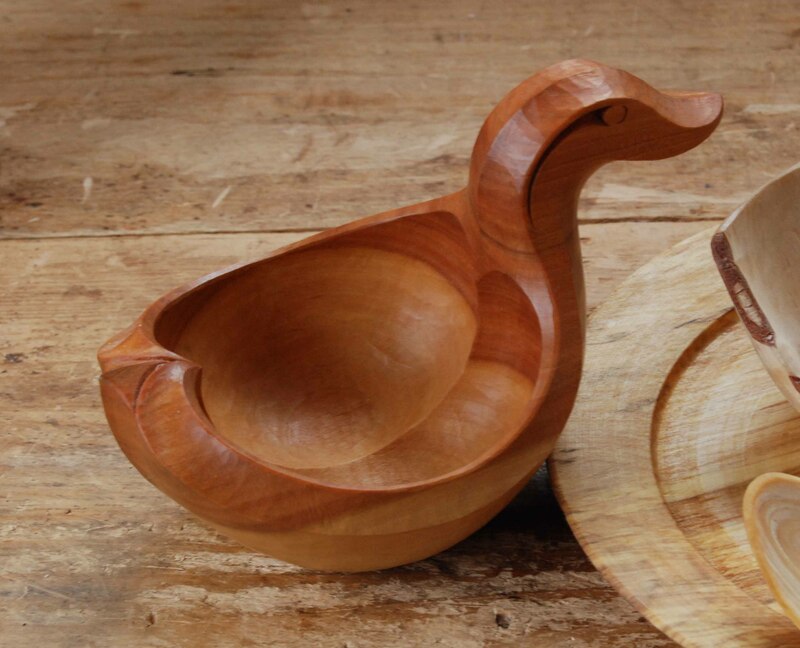 “I have been carving all my life, from blocks of soap at the age of five, to carving wooden spoons which I started about six years ago. 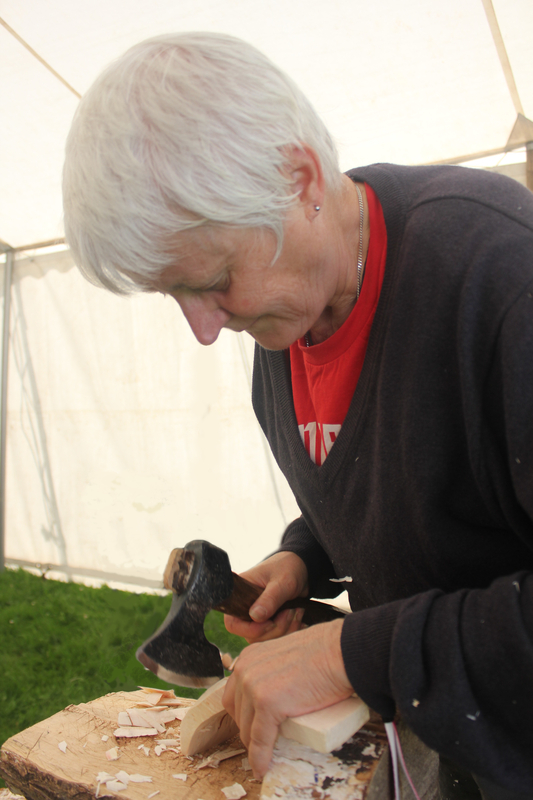 As well as teaching at home, at Spoonfest and last year at Täljfest in Sweden, I organise an annual green wood working festival where I live, in Brittany, France. 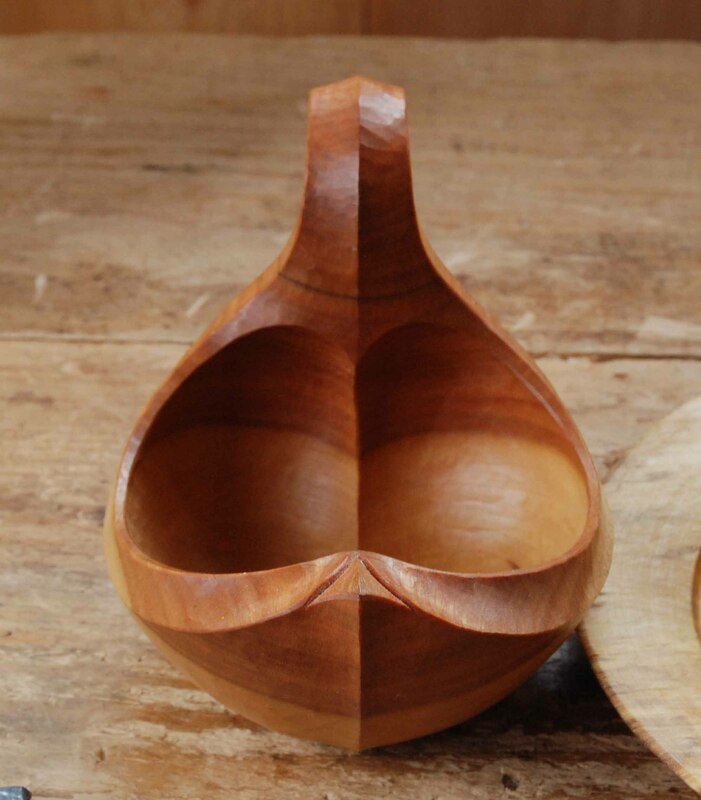 Although I do different types of green wood-working, I am particularly fascinated by wooden spoons – what appear to be simple, everyday objects are, in fact, very subtle three-dimensional shapes. 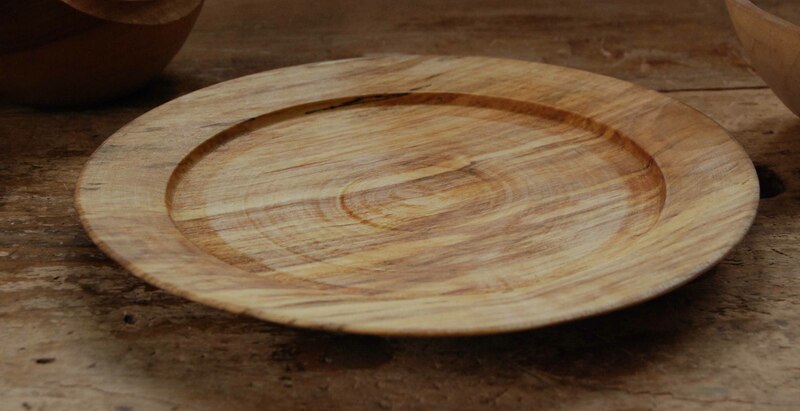 The variability of the wood itself means that making a beautiful, functional wooden spoon is a real challenge that is never the same twice. 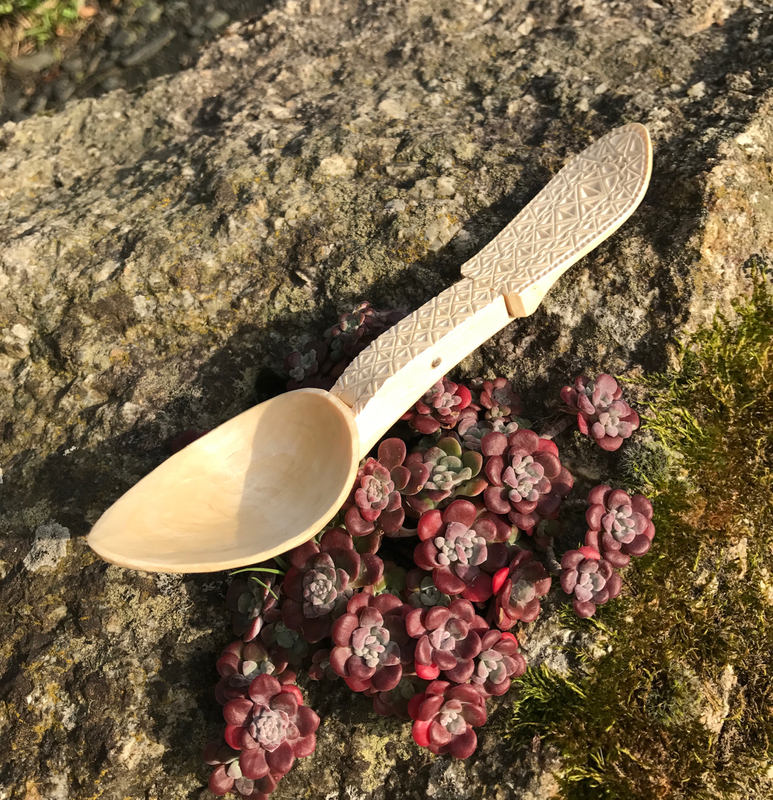 Here’s her spoon, based only on the photograph, she’s yet to see that spoon in person! 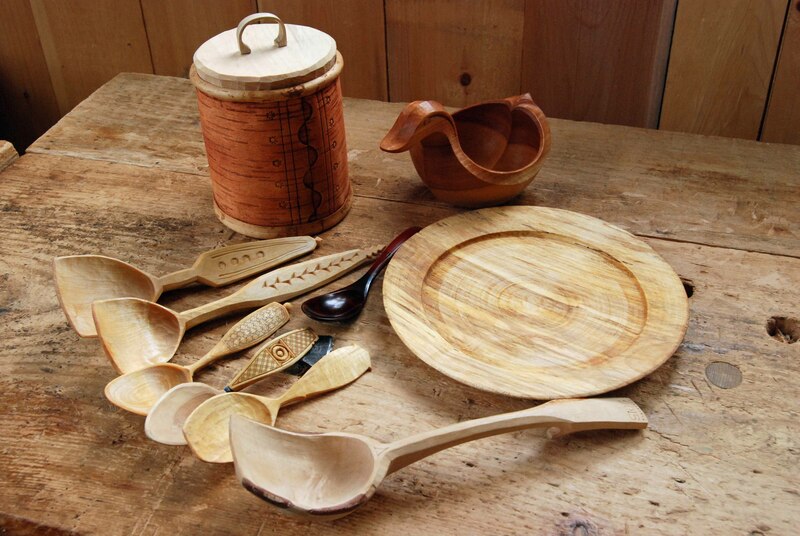 I don’t teach or demonstrate spoon carving at the Greenwood Fest. 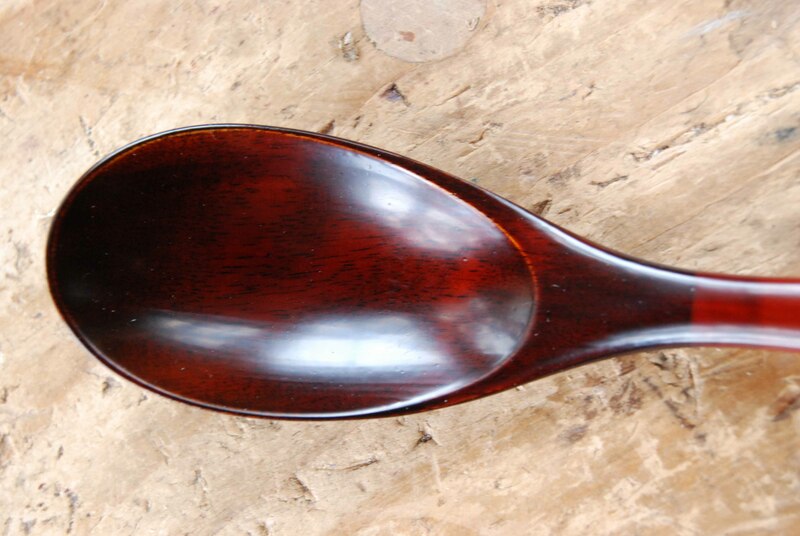 Mainly because we have lots of great spoon carvers there, & I want to concentrate on adding furniture work to that event. I did carve one while Jogge Sundqvist & I did a duo presentation…but the bulk of my handwork there is (and will be in 2017) oak furniture. 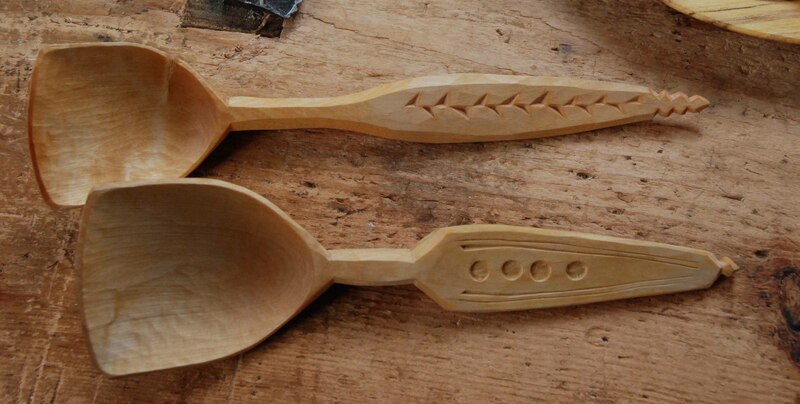 But, I carve spoons a lot. 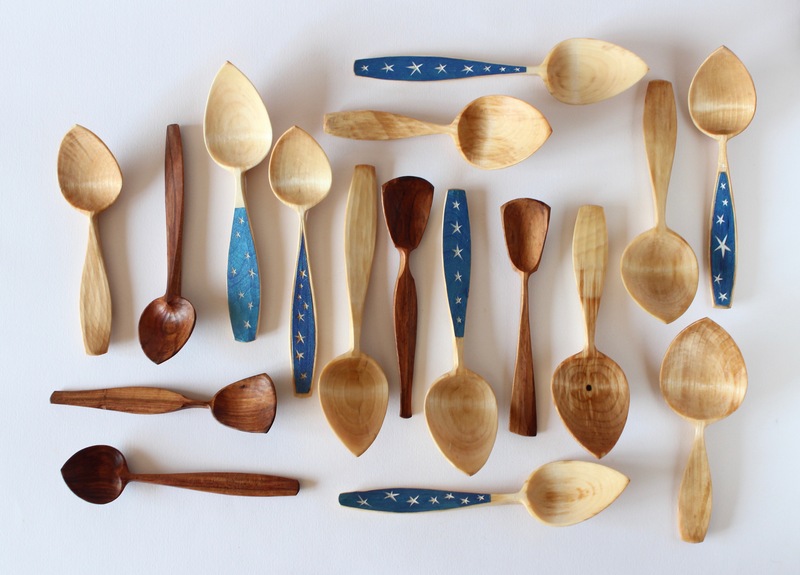 Note, that’s not “I carve a lot of spoons.” There’s a difference, a big difference. When I first read it, I thought – what about Jogge Sundqvist and his well-known presentation about the trees talking to him? I’ve now been to Sweden and I think there is magic in the wood-culture there! But I think the tag line in Barn’s “rant” is “this idea once came from a good place…” – he goes on to say there are carvers who haven’t put in the requisite time learning the basics before delving into the far-out end of things – at least that’s how I read it. For me, the trees don’t talk to me, but I had 20 minutes of spoon carving this fall that were the best of the whole year. The spoon in the photos here is easily the best spoon I made in 2016. 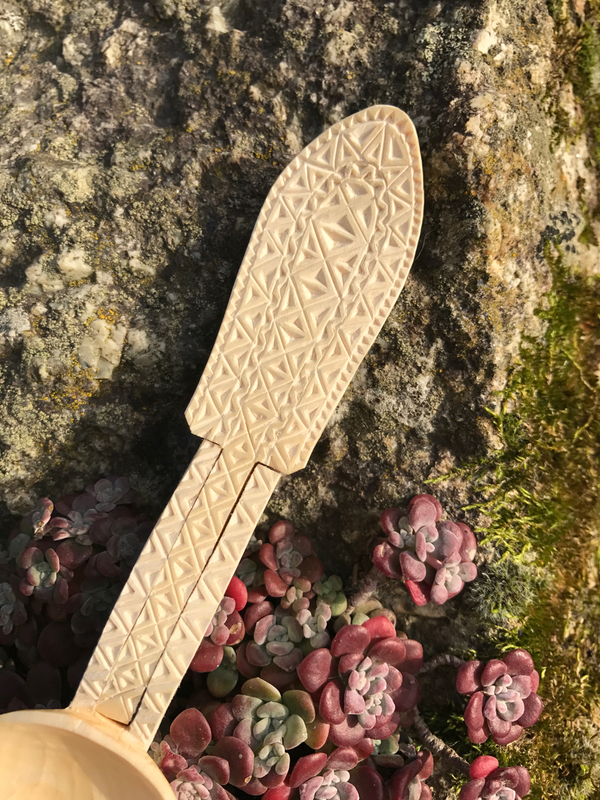 I knew within the first 20 minutes of working it that this spoon had everything I like about spoon carving. 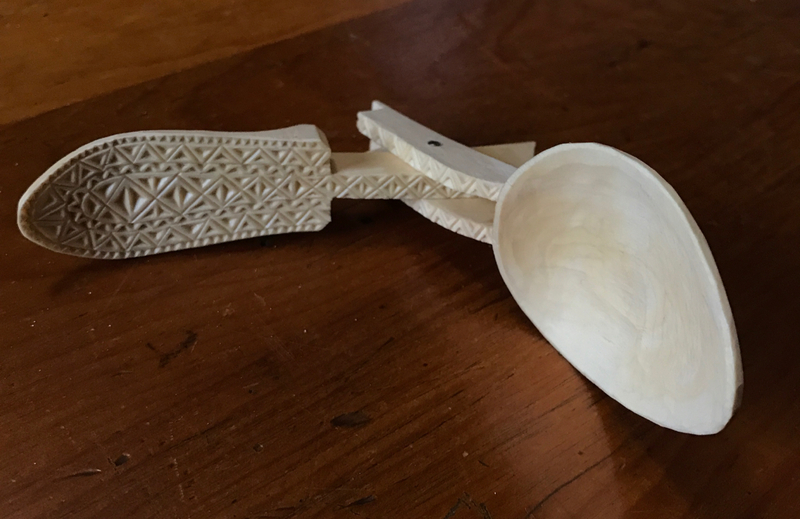 I described it to several people as “this spoon carved itself.” – Of course the spoon didn’t make itself, but there was little I had to do to get the shape to work, and to flow along the grain of that crook. I’m guilty of making really whacky shaped spoons every so often, but I present them as such. 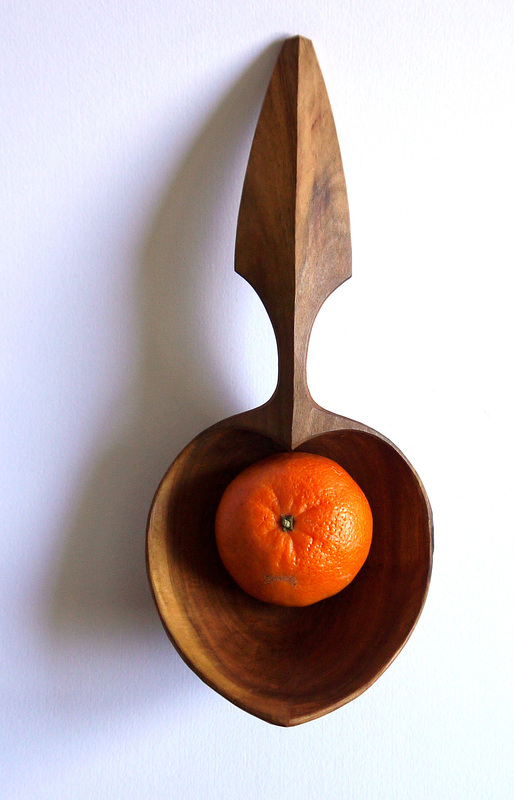 This one is both a free-form shape, and a functional spoon – the best of both worlds for me. 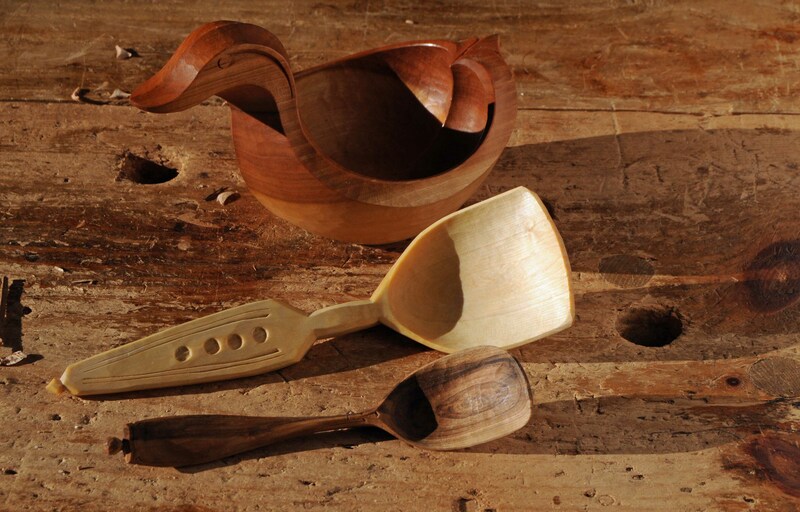 I don’t have the discipline of Barn, JoJo Wood, Jarrod Stone Dahl (to name a few) to make lots of straight-grained spoons – for me, the fun is in the crooks; finding the right chunk of wood, and getting the spoon from that. I squirreled away some crooks, and over the next couple of weeks I’m going to split ’em & see if I can get back to that 20 minutes of spoon heaven. Tim Manney is one of our returning instructors from the first Greenwood Fest for 2017. 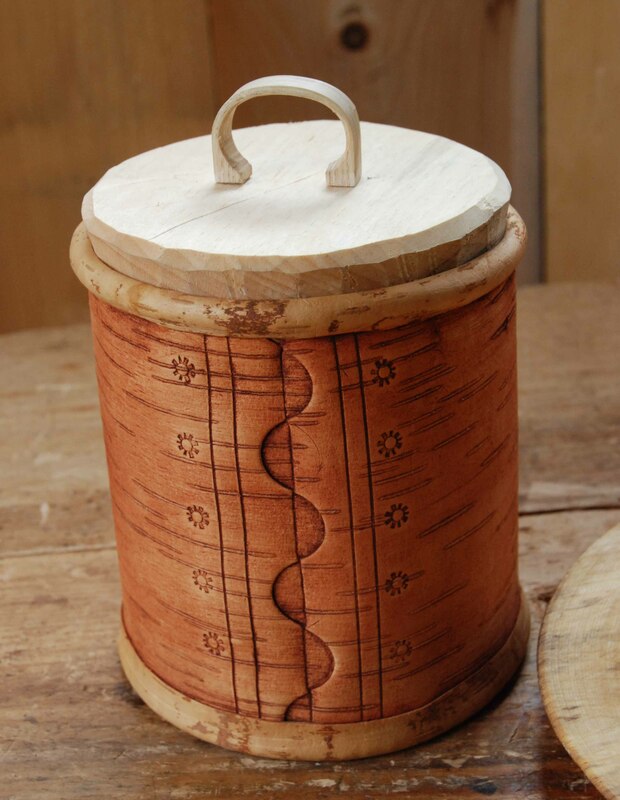 If I had Tim’s talent with my ego, I’d take over the woodworking world. But Tim is very humble and quiet, which can sometimes fool you. There’s lots to learn from him. 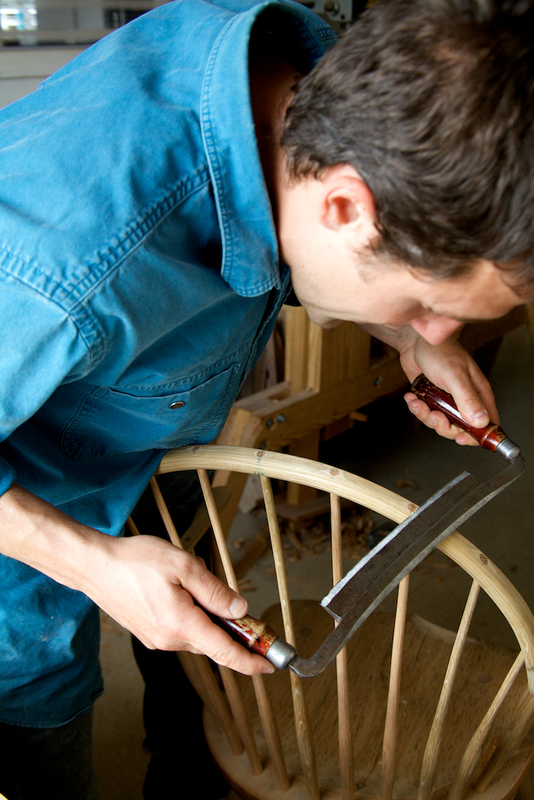 Last spring at the Greenwood Fest, he demonstrated his ladderback chairmaking techniques, along with teaching a class in making steam-bent spoons. 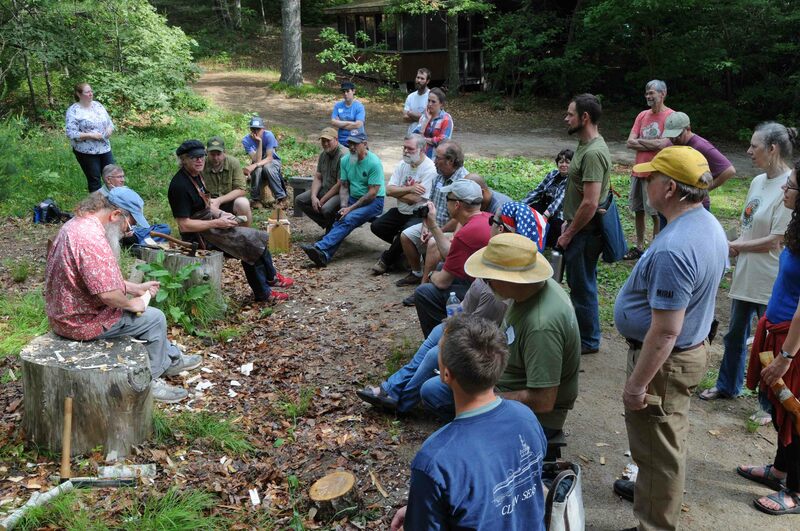 Tim recently taught a sharpening class with Plymouth CRAFT that really took off; so much so that he’s slated to teach another 2-day class in sharpening before the festival. 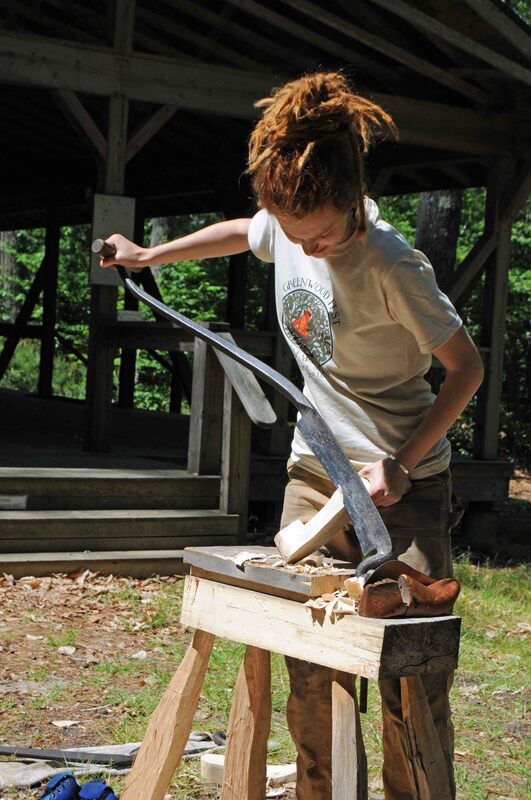 In the sharpening class, he was able to help people re-grind hatchets to a shape more conducive to perfect slicing action, everyone worked at sharpening and honing their sloyd knives; tackled tricky shapes like gouges – there was nothing they wouldn’t take on. Many were beginners, but several (including me) had been around edges for ages…there was much to learn. 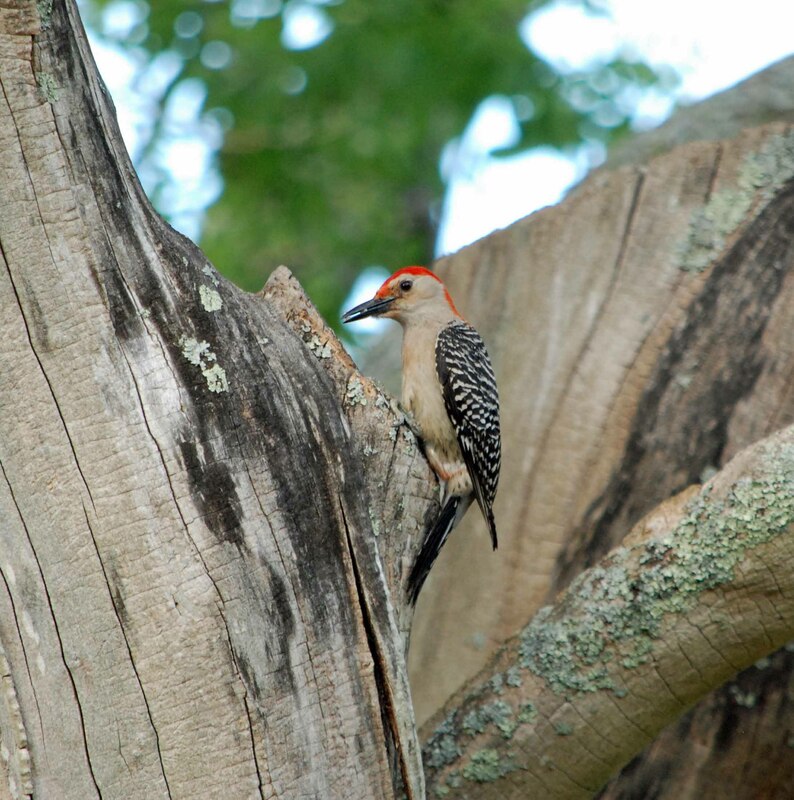 It made us scramble around to find more things to sharpen – it was that good. 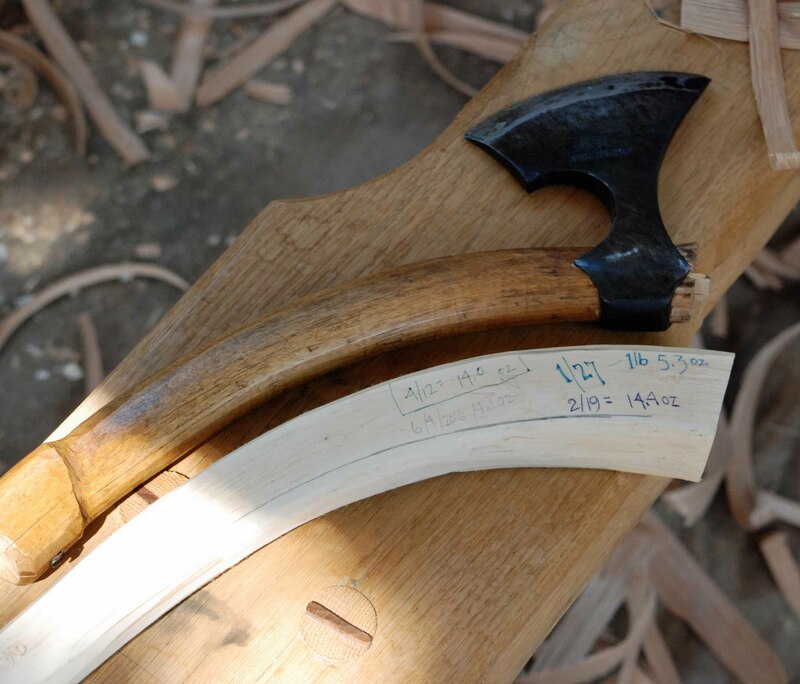 So sharpening your tools with Tim before the festival will put you in the best position there is…perfect edges, ready for wood! We had no sharpening topic in our first version of the fest, and there were times when people were left knowing their tools needed attention, but we had nothing to help them with. That’s fixed this time around, thanks to Tim. 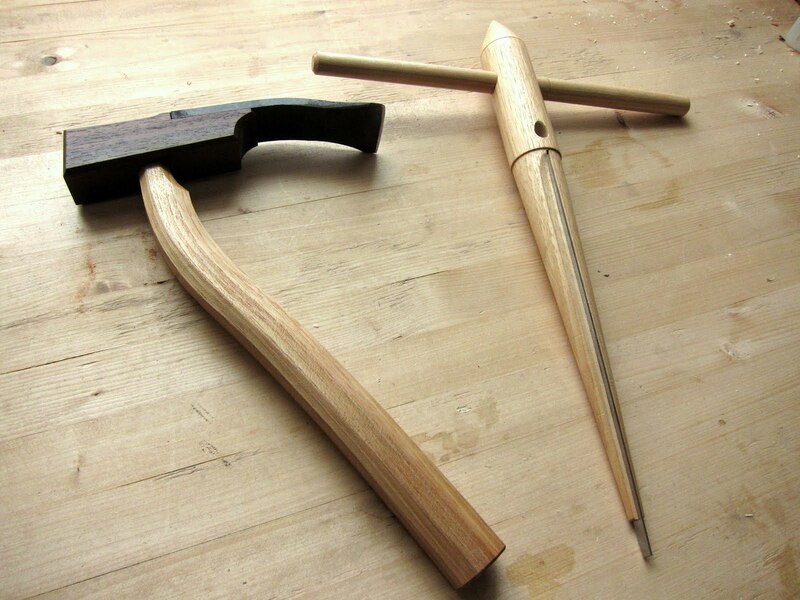 Tim’s range of ability is broad – chair-making, tool making (reamers are a specialty of his, and his adze is really a beautifully simple tool), spoon carving and more. 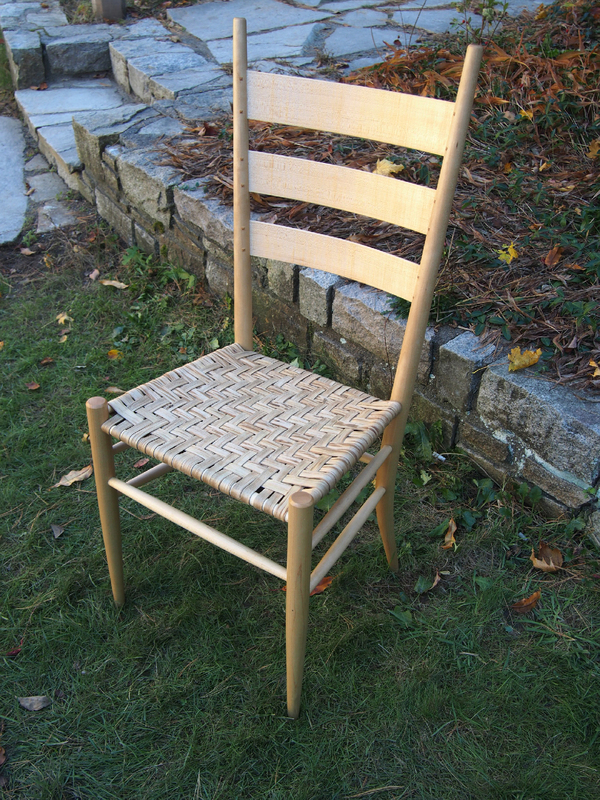 One additional idea he had was a demo of hickory bark seating. 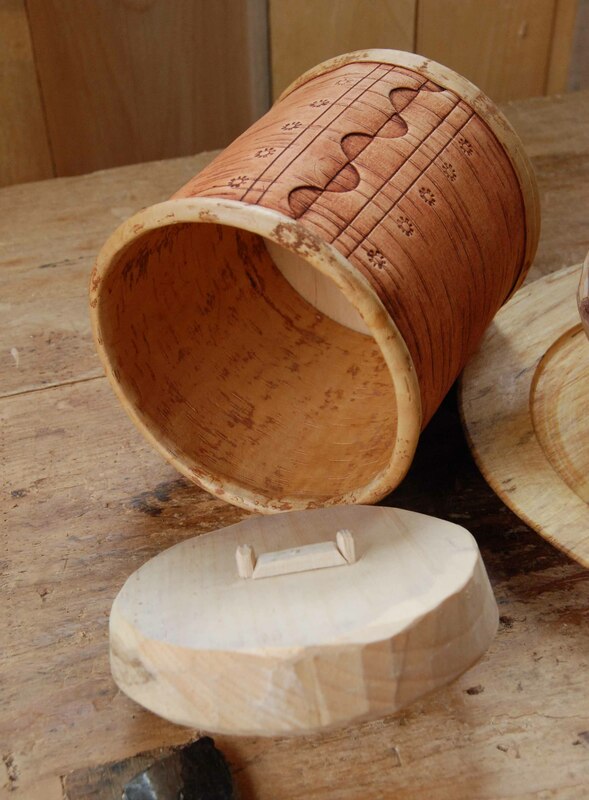 If you met Tim last year, or at one of his other appearances around the woodworking circuit, then you know how engaging his presentations are…if you have yet to meet him, this is your chance. Recently I wrote about inspiration in the form of a slew of new books. There was more inspiration stemming from the Season of the Fest – Greenwood Fest, Spoonfest, Täljfest and beyond. Here’s a few items I gathered; some gifts, most purchased, from some of the people I worked alongside. Another British wonder – Adam Hawker. https://www.facebook.com/profile.php?id=100005448825480 great stuff. 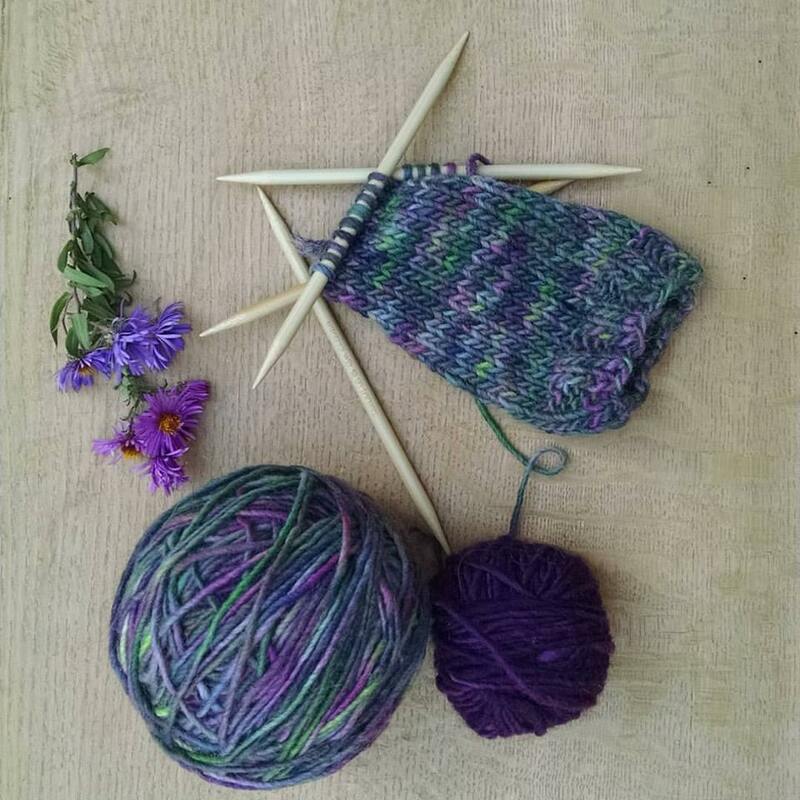 2 by Beth Moen, https://www.instagram.com/bethsusana/ bookended my Season of Fests w Beth at Greenwood Fest in June & Täljfest in August. Thanks for posting it Niklas, I got to see stuff I missed! I told you I feel inspired. 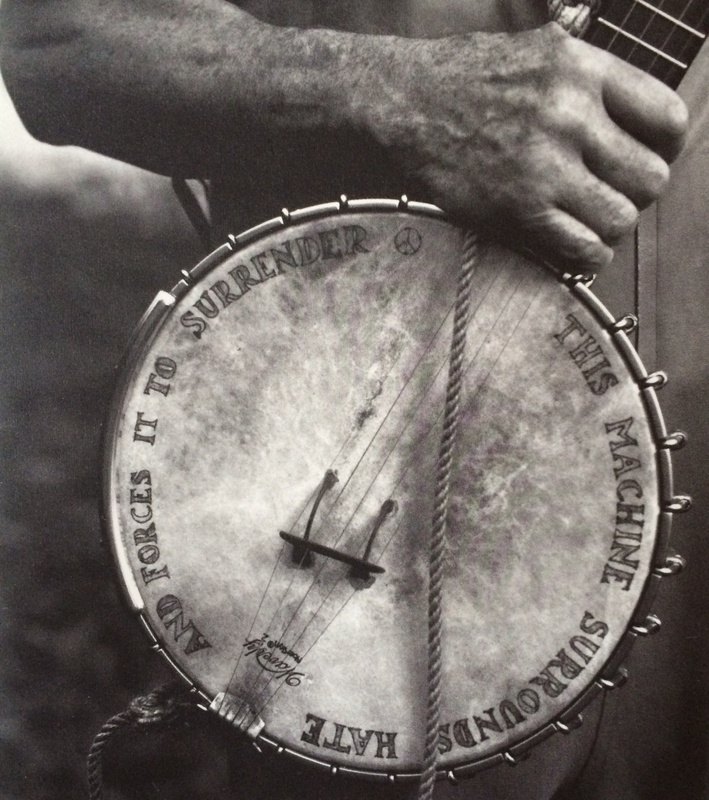 I remember when Pete Seeger died, I searched the web for a photo of his banjo – this week it served as an idea for some wood carving. I’ve had these items rattling around the house since Greenwood Fest; further inspiration. A bowl by Dave Fisher, large spoon Beth Moen, small spoon Derek Sanderson. 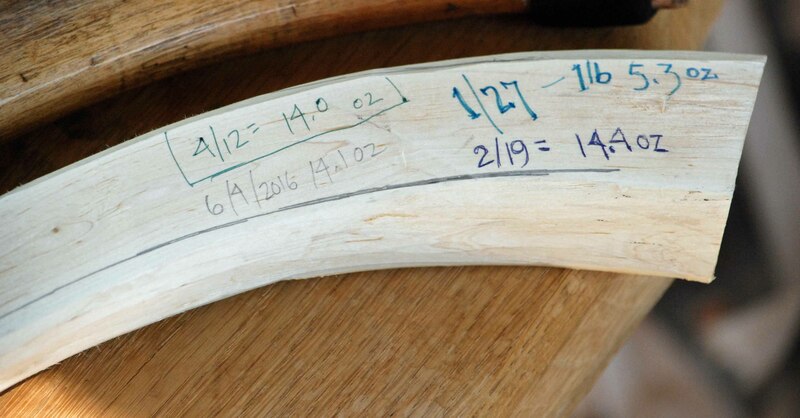 So I weighed this piece of wood one more time, and got the same weight as recorded here in April & early June – 14 oz. here’s where it will go, a replacement handle for my old Viking-style hatchet. a favorite quote from Bill Coperthwaite, found in his book A Handmade Life. 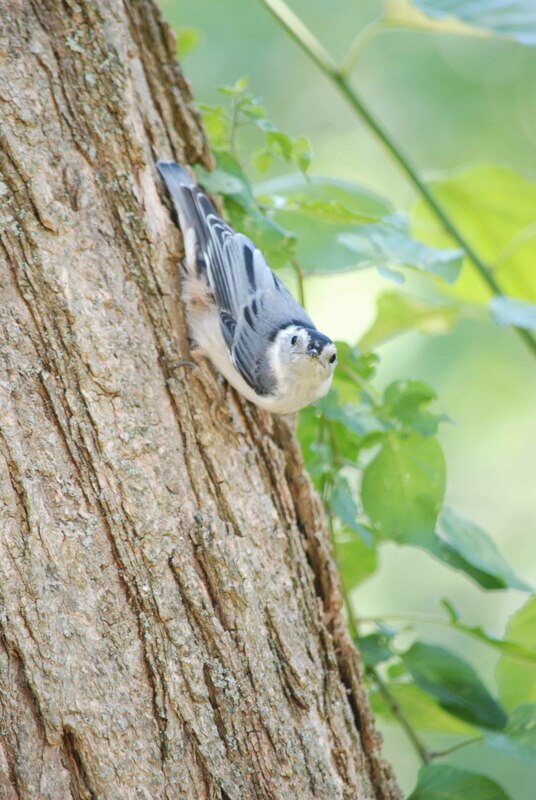 Meanwhile, some birds around the workshop project, which is roof shingling. 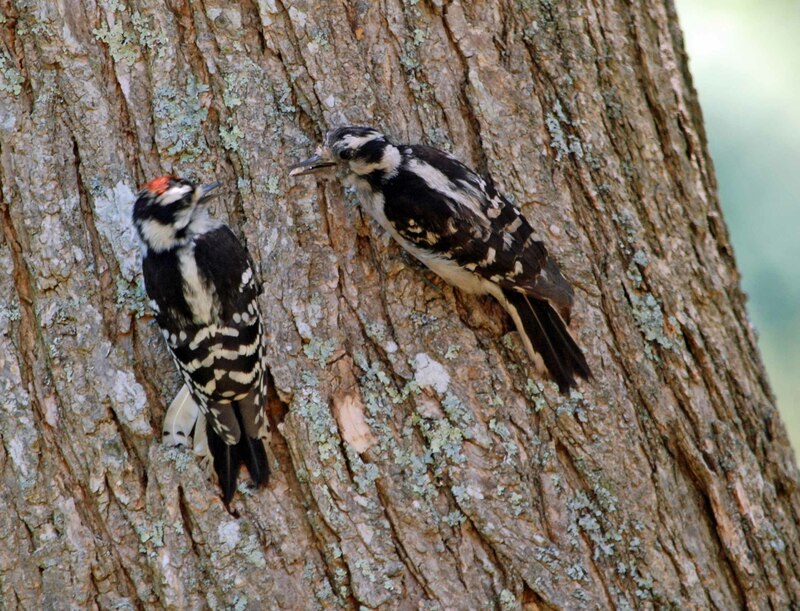 female downy woodpecker (right) feeding male young. 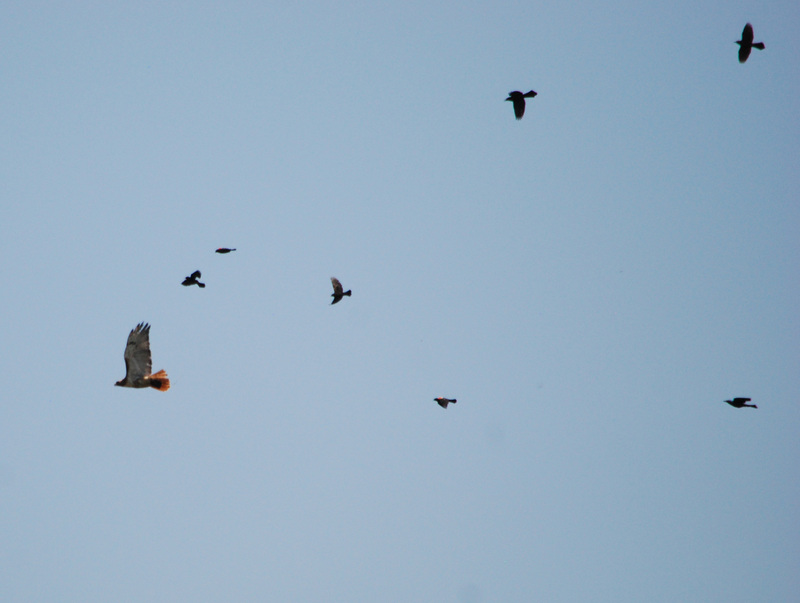 red tailed hawk, every day being chased off by grackles, blackbirds, blue jays – you name it, they chase ’em.